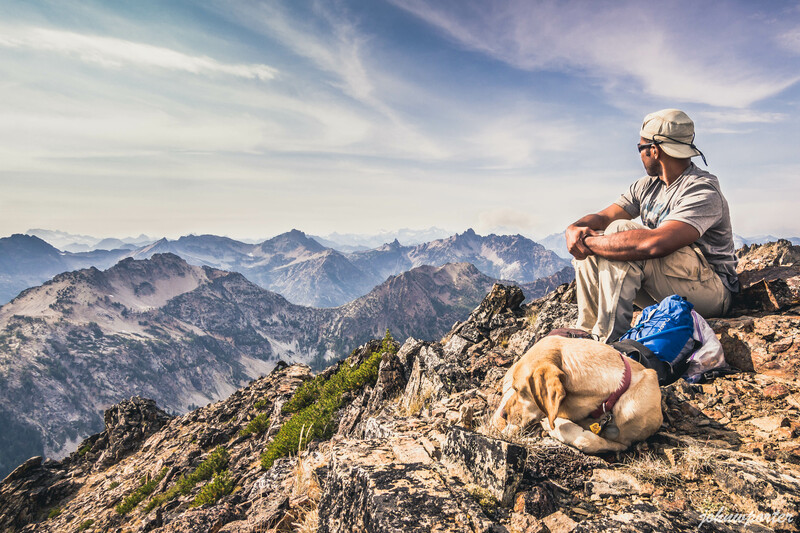 I can’t remember the last time both of us felt this exhausted from a backpacking trip. This was one of the most memorable trips with new experiences. Pup’s first ride on a seaplane, our first ride in a canoe, plus entering the area one day before wildfire closure. I was also here couple months ago climbing Dark Peak, and that in itself was an unforgettable experience. 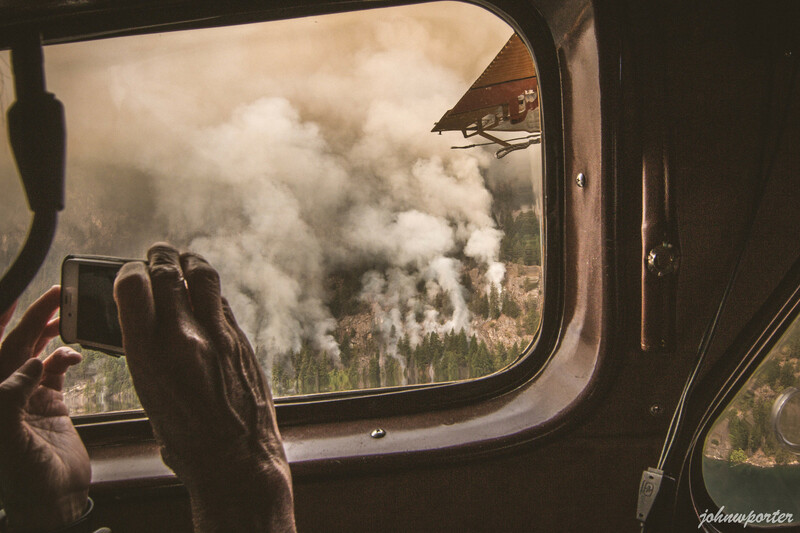 On the seaplane to Stehekin, all of us witnessed what was to become part of the largest wildfire season in Washington State history. Flying halfway up Lake Chelan, smoke from start of the Wolverine Fire spewed from several gorges west edge of the lake. Smoke had permeated Chelan sky to obscure south views when we landed in Stehekin. A nice couple we met on the plane lent us their canoe to ride from top of the lake to Weaver Point Campground. That saved us from having to head north on Stehekin Shuttle to Harlequin Bridge, then hike three miles south to Weaver Point. Due to fire, a notice at the Devore Creek Trailhead had detoured Pacific Crest Trail (PCT) hikers here. We ended up not seeing anyone on Devore Creek Trail on day of the approach, and saw no one on the same trail the approach to Flora Mountain. It seemed odd since I thought we would have lots of company due to PCT detour. But then it all made sense when we exited on day four, that the same sign by the trailhead had since been updated to “area closed until further notice.” So other than my emergency contact, it was unnerving to realize that no one knew we were inside. 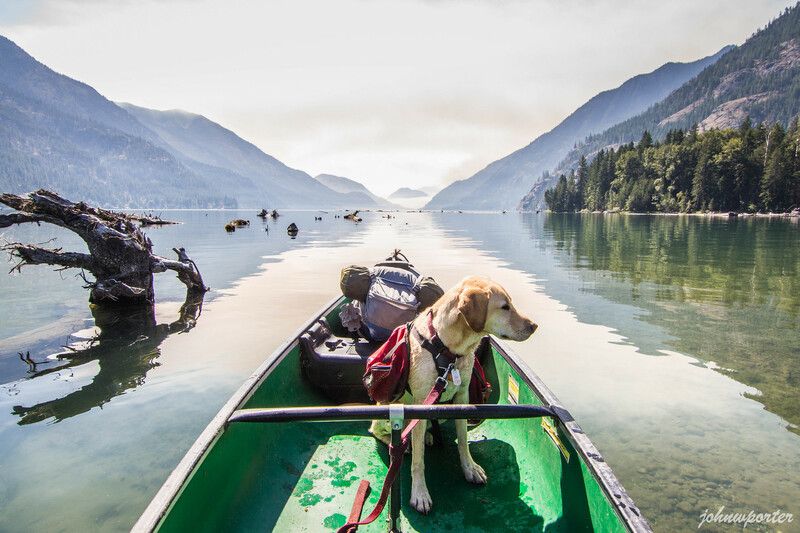 The approach was hot and sweaty by way of seaplane, canoe, and feet and paws. 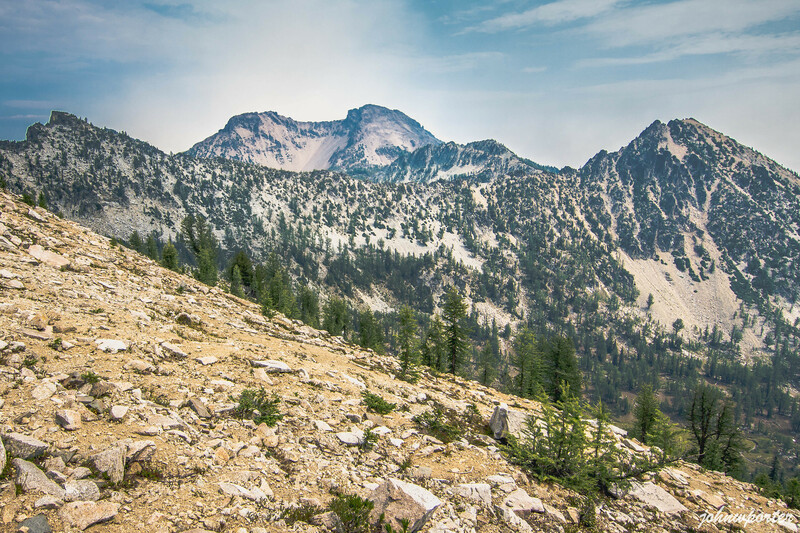 Soon as we got through switchbacks on lower part of the trail, Stehekin had completely disappeared into smoke. We began the scramble from Bird Creek Camp at 4,100′, found a flat, woodsy area at 5,500′ in lower Bird Creek Basin and called it a day. Starry night, perfect for star trail shots amid tall trees. 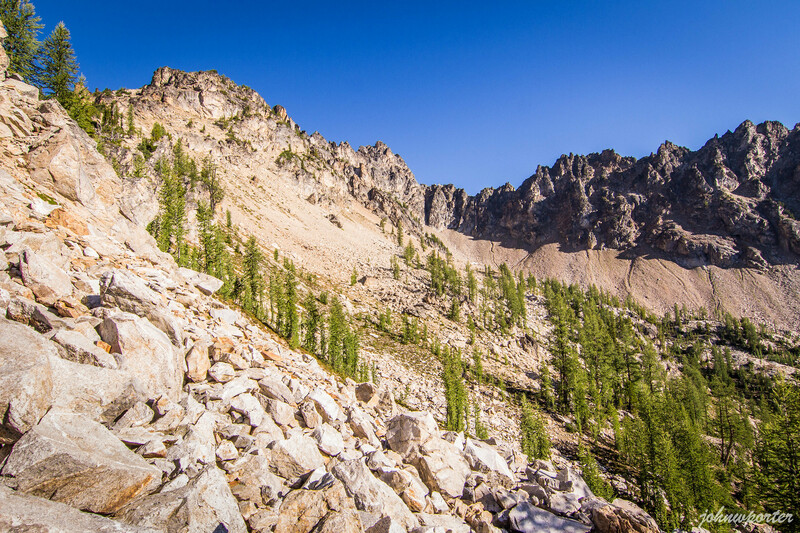 Left camp shortly after sunrise and headed northward on steep slopes to attain Tupshin’s southeast shoulder at 7,000′ then descended into the big talus basin below Tupshin’s southeast face. Pup stayed on a big snow patch with a tiny flowing stream at 7,200′ while I went to tag the peak. Initially misinterpreted beta, got off route and went too far east on steep rocks. Later rerouted through Tupshin’s east ridge and reconnected with standard route just below summit. Lots room on summit with a freshly placed register by a party few days earlier. Smoke seemed to have multiplied hundredfold from Wolverine Fire to the south by Holden Village. Not sure if pup could hear me, but I constantly yelled out to assure him of my presence. I saw a tiny yellow dot moving about on the snow patch so I knew he was all right. Scoped out route to Devore Peak at head of Bird Creek Basin as well as next day’s target Flora Mountain two basins southeast. Everything sure looked far(ther) person than on maps. On the descent I mostly down climbed except at the belay station with old, raggedy webbing. Just to be safe, I backed up the anchor with new webbing for the rappel. My 30-meter alpine rope worked great in getting me onto the ledge below. Then I down climbed rest of the way on southeast face back to talus and reunited with pup. He probably wondered where I was all this time when he only heard my voice from above. Got back to the 7,000′ shoulder and descended 1,000′ southwestward on steep slopes down to Bird Creek Basin at 6,000′. From there I had a hard time locating the gully mentioned in some reports, instead we stayed north of the creek and veggie belayed up to outlet of the moraine lakes at 7,000′ basin. We headed southward on easy terrain to the 7,500′ notch on Devore’s east ridge and stayed mostly on ridge crest. Bypassed gendarmes from the north side, regained ridge crest, and traversed along south side of ridge to west of Devore’s south ridge. We carefully worked our way through exposed sections and arrived at the class 4 steps before false summit. Pup stayed here as it was not ideal get him up those steps. Got around false summit on the west to find true summit on other side of a steep gully. Easy scramble through gully to the summit, couldn’t imagine getting through this section in snowy conditions. I looked for Tupshin Peak right after summiting. Holy cow, Tupshin looked so pointy from here! Did I really just summit that thing this morning??? Everywhere I look it was smoky, and the start of Goode Fire caught my attention right away. Guess my chance of getting Goode Mountain this season was slim since access would most likely be closed off. Not sure if pup could hear me around false summit, but I yelled out to him several times anyway just in case. Air had become more polluted, and I was beginning to feel something in my ears and nostrils. Grabbed the pup on the way down then rushed down to upper basin. I tried to locate the same gully I looked for earlier, but instead we followed our route back into the basin. It got dark just before re-entering the forest, a short section of bushwhacking later and we’re back at camp. Neither of us wanted to get up this morning, knowing that we had a much longer day ahead. Headed back down to Bird Creek Camp and dropped off overnight gear before setting off for Flora Mountain. Got to Fourth of July Basin in good time albeit heavy-footed, left trail and scrambled toward gully adjacent to Riddle Peak’s north peak. A large cairn at the pass meant we were on the right track. No views into Riddle Creek drainage on other side of the pass, just steady smoke coming in from the south. We were almost out of water at this point. From the pass, we headed north and bypassed Point 7716 on its south while traversing eastward. For the most part we were able to stay on the rocky ridge crest until the 7,400′ notch west of Point 7734. We dropped down onto the north scree slopes and painstakingly made our way across to Point 7600, traversed around its cliffy north side into the meadow below. On the way back I realized we could have easily bypassed Point 7600 from the west for a more “relaxing” traverse. We were both thirsty. There was water lower in the basin but I was too tired and lazy to drop elevation. Pup found a hidden snow patch with a small pool of water so we quickly took advantage of it. As we slowly walked up southwest face, I located a faint climbers path and followed it for a while before it petered out before the talus. Getting through last couple feet felt like an eternity, since we were both so exhausted that we took baby steps one step at a time while playing leapfrog. Got distracted by the wildfires and taking photos, and never got the summit nap I promised myself. Wolverine Fire seemed to have grown larger since yesterday, judging by the size of the volcano eruption like smoke permeating the sky. A couple of small fires started to form on north side of Lucerne Mountain across the basin. Tupshin and Devore looked so far away from here, still couldn’t believe we climbed those just the day before. Some distant mountains were hard to make out because of the smoke, even the nearby ones looked somewhat hazy. We rested long enough to recoup before going down the mountain. It got completely dark when we reached bottom of the gully in Fourth of July Basin. We took a power nap among talus then finished scrambling out onto Devore Creek Trail. We hurried ourselves back to Bird Creek Camp and got some rest before the long trek out bright and early. Rain came down during the night, glad the tree coverage kept the tent from getting too wet. Got up and packed by 3:30 AM to allow ourselves ample time and catch the 9:45 AM shuttle at Harlequin Bridge. From Devore Creek Trailhead, we headed north on Stehekin River Trail, which was by far the most mosquito-infested trail we had ever been on. Deet did nada to those buggers, at times we were half running and trying to get them off our necks and faces. Once we came out of the trees jungle into the open space by the landing strip, most of the mosquitoes had disappeared. Before we got to Harlequin Bridge, a ranger driving her truck stopped and asked if I were the guy climbing mountains with my dog. Apparently the couple with the canoe mentioned to her I went in the closed off area and so she kept an eye out for me. Talk about hospitality at its best! She then offered to take us back into town, dropped us off at Stehekin Bakery so we could get a bite and then catch the shuttle back to the dock. Food had never tasted so good after a long climbing trip. I only found out at the dock that the seaplanes had stopped running due to fires and smoke, so we waited few hours for the slow ferry to show up in the afternoon. Pup slept under the community bulletin board the minute we got back and didn’t move an inch until ferry arrived. Hard to believe he was THAT exhausted! Pup had to be crated on the ferry, but he slept like a baby and didn’t seem to mind where he was sleeping. The four-hour ride actually went by fast as a gentleman and his wife chatted me up about climbing and photography. He was also curious about the Bulger List and asked me a bunch of questions about my trips. Got into Chelan at 6 PM, followed by a 3.5-hour drive home to Seattle.